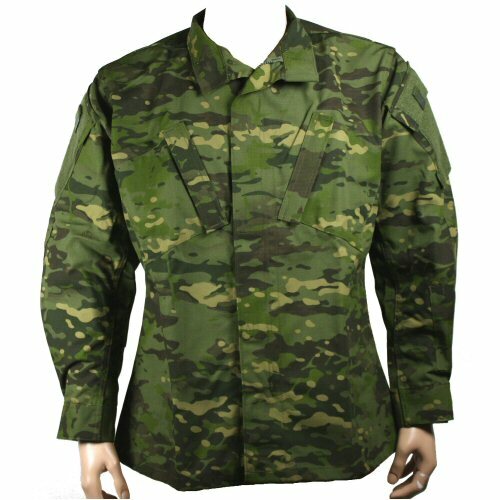 The Truspec Tropical Multicam Tactical Response shirt features genuine tropical multicam as developed by Crye Precision. This combines the dot, blob and dash pattern of multicam with an overall jungle green tone suitable for heavily vegetated and coppiced green environs. The Truspec Tactical Response range incorporates features familiar from ACU uniforms, such as mandarin collar, velcro cuffs, two velcro chest pockets, two arm pockets with velcro areas for patches, concealed front zipper and upper back pleats for movement. Two pen pockets are also found on the left sleeve. The shirt is manufactured in 50/50 NYCO ripstop fabric. Medium weight fabric is tough and partially windproof without being difficult to dry and overly heavy when worn. Machine washable. Multicam Tropical has been tested for concealment in woodland, jungle and grassland and shown to be extremely effective. Sizes are S (38 in chest) M (41 in chest), L (44 in chest), XL (47 in chest).